Turkey. Stuffing. Mashed potatoes. Pies. Family. Friends. Football. These are some of the things associated with Thanksgiving in the United States. Football has been played on the holiday since 1869 in Philadelphia. While most people associate Thanksgiving football with the NFL’s slate of games, there are many high schools competing against each other that morning before families and friends sit down for dinner. Check out some of America’s best Thanksgiving Day high school football games. This is where it all began. New London and Norwich Free first played in 1875 and this series is the oldest high school football rivalry in the United States. The series has seen everything from cheating faculty to biased officials to vandalism and then some. There’s even a book out on it. Boston Latin is the oldest school in the country, being established April 23, 1635. English was founded in 1821. 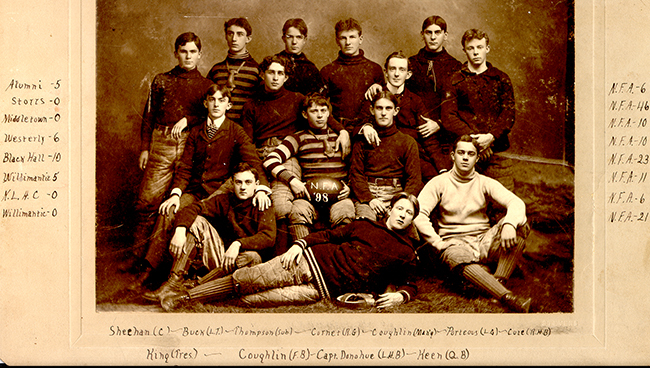 The schools started playing against each other on Thanksgiving in 1887 at Harvard University. The game is the longest continuous Thanksgiving Day rivalry in America. Calvert Hall and Loyola first played Nov. 12, 1920. The “rivalry that exists between them had made the contest the most important on their schedules,” The Baltimore Sun reported the day after Calvert won 9-3. The game eventually evolved into the Turkey Bowl and is the third-oldest rivalry in the Baltimore area. This annual game that began in 1905 features two of the best and most successful teams in their respective states. Easton, located in eastern Pennsylvania, is the second winningest team in the state. Phillipsburg, just across the Delaware River in western New Jersey, is the Garden State’s winningest team. This rivalry has a book on it out, too. This is the oldest high school football rivalry in New York. Fordham Prep and Xavier first played on Thanksgiving in 1905, but playing on the holiday didn’t become an annual schedule staple until 1927. The Turkey Day Game between these schools located west of St. Louis began in 1907. The winner receives the Frisco Bell, while the loser is sent home with the Little Brown Jug. The two communities host a plethora of events leading up to the game, including a Friendship Dance that began in 1939 — a gesture of friendship between the two schools. There is a book about this game, too. The turkey wishbone isn’t the only bone being fought over on Thanksgiving. San Jose’s two oldest public schools have been battling for a large steer leg since 1945. The rivalry, which started in 1943, became known as the Big Bone Game two years later after a San Jose HS student found the bone in his father’s butcher shop. He thought it would make a good trophy for the rivalry game, and after both schools agreed, it became priority No. 1 for both football programs. Separated by a mere two miles, these two small schools in southern New Jersey first played against each other in 1902. Playing on Thanksgiving became a staple 20 years later in 1922. The winner of the annual Turkey Day game receives the Mayor’s Cup. “The game is special. Generations can be traced back who have played. Grandfathers have played, fathers have played,” Haddonfield coach Frank DeLano told The Medford Sun. Benjamin Ree doesn’t play chess. In fact, the Norwegian filmmaker finds the game a bit boring. “For me, watching chess is like watching paint dry,” Ree said.